... and the winner is.... The Potato Silo potatoes! they're the ones to the left. These are not the entire yield, obviously. I dug just enough for dinner. Potato Silos were planted last, grew tallest (up to 5 feet plants), made lots of berries, and a lot of the foliage are still green so I'm harvesting as I need them. The All Blue and Adirondack Blue potato foliage in Bed#1 are also still alive. I'll compare their production levels next. Flip side, as you can see, some kind of burrowing animal has found the Silos and munched on a couple of potatoes. I took one of my cats out on a leash and harness and had her rub all around the Potato Silo. Hopefully that helped. In the #1 bed, the main pest is wireworms. I found 1/2 dozen tubers with holes tunneled all over. But I did unearth 3 wireworms and dispatched them. Great harvest, Applestar! I just started my midseason cycle of potatoes (I grow 'Atahualpa' and 'Oro Morado' - the first are a red and gold-skinned type with yellow flesh, and the second a yellow-skinned type with purple polka-dots and gold-purple striped flesh) and I'm hoping that the dang sparrows stay off them this time. My cat chases them off most of the time, but she's not always in the backyard and they tend to dig up my seed tubers and eat the shoots. I've netted the bed, and we'll see what happens. YUMMY! We have had a few over the past few weeks and they are so yummy! nice start you have there. Those look tasty. I had a problem with disease and I can say that I got slightly more potatoes out of my pots than I did out of the ground. A lot of the ground plants just rotted to nothing. But try and try again. Last year I had bumper crops of spuds. Well for my small garden at least. Is it too late to put a few potoes in, in a hay mulch bed? Would you be able to harvest any before winter? I'm debating trying, just wondered what others thoughts are, we are located in central Alberta Canada. I think it probably is too late now. You need at least 90 days even for early varieties, and that's for the small potatoes. 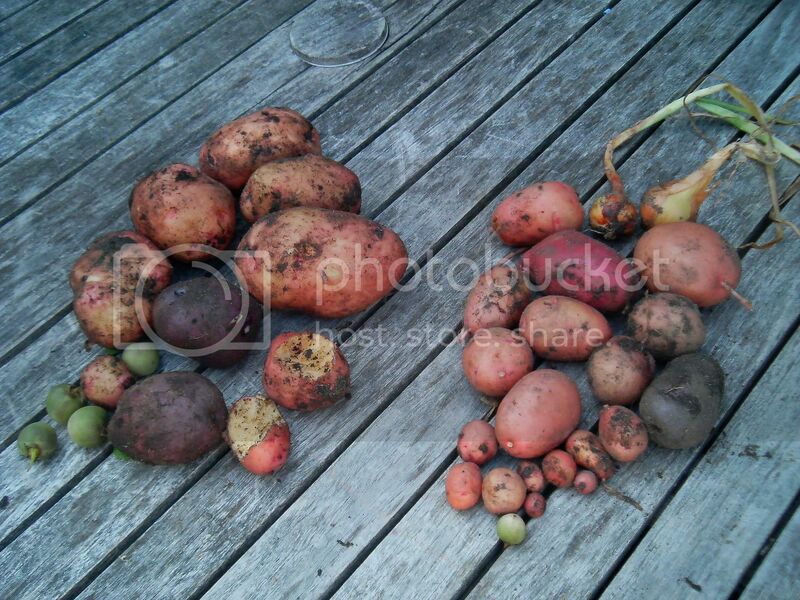 For full size tubers, I believe you need more. Potato foliage will die at first sign of frost, just like tomatoes. In addition, you have the freeze to consider. There are probably more possibilities in areas where the ground doesn't freeze. Wow, nice harvest and interesting experiment results. I like the "blue" potatoes, definitely want to give those a try sometime.